2018-05-19 AFD: 21.3; SD 3.94; CV 18.5; CF 97 at 32 mths. Full Peruvian, super fine gem! Rich Dark Brown (gorgeous maroon) with black points. 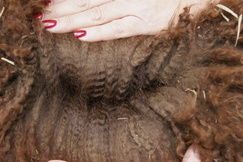 Excellent coverage and conformation, shearing 6.1 and pregnant. Not only is she super fine but very dense as well. Bloodlines include Misty Maiden, Accoyo Victor Vaccoyo, Accoyo Victor, Marcoyo, Accoyo Royal Fawn, Accoyo Camillio, 5Peruvian Camelot Dark Brown, full Alianza legend. Mimosa delivered a stunning Dark Brown Full Peruvian Female with amazing bundling and brightness. This little one hit the ground running and is full of energy. Mimosa proves to be an excellent Mother with plenty of milk and very attentive to her cria. 8/27/15 - Mimosa delivers another stunning DB Female, sired by .38 Special. 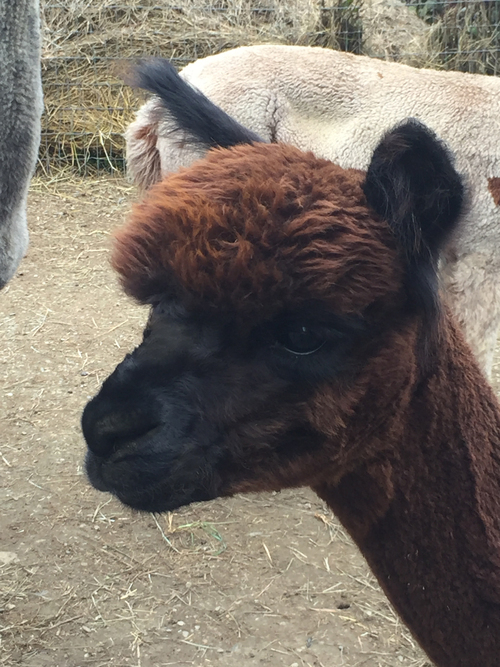 This girl has density, crimp and perfect conformation, very similar to her first cria pictured here. Mimosa did it again! Giselle is a gorgeous rich DB female with black ears. Giselle has excellent substance of bone and fiber density. 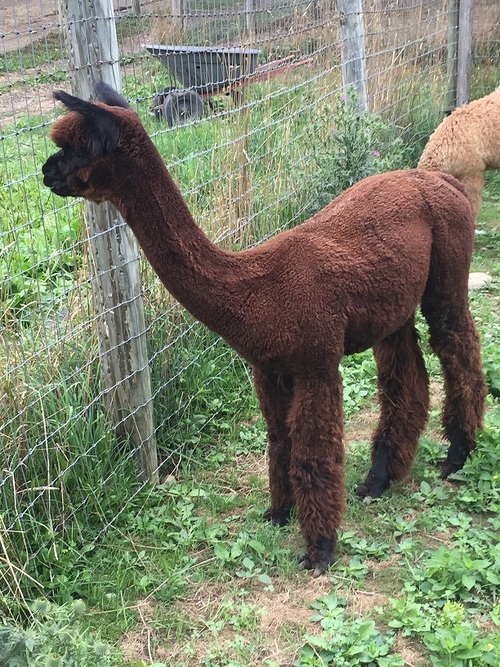 Her fleece is absolutely beautiful, long staple length, bright, soft, fine consistent coverage from topknot to toes. Long straight legs, square frame and correct bite, presenting a striking phenotype - perfect! 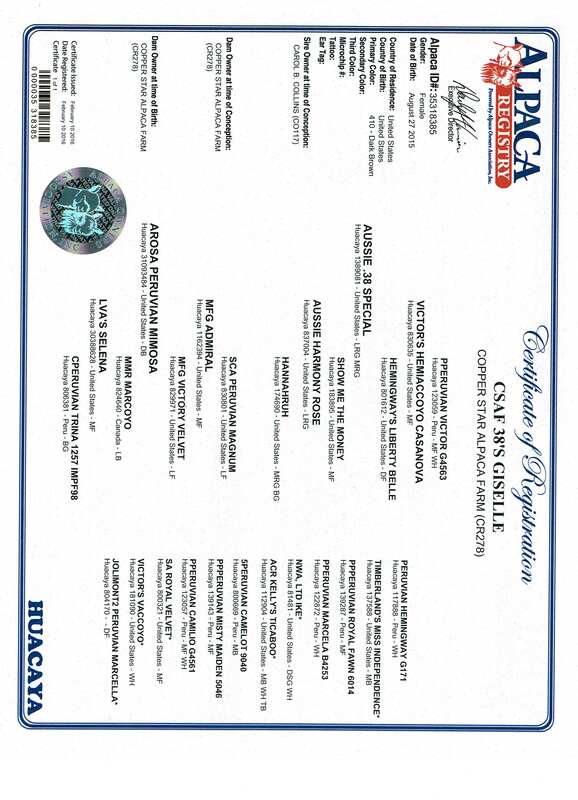 Giselle's lineage helps explain her high quality traits: Victor's Hemiaccoyo Casanova, PPeruvian Victor, Peruvian Hemingway, Misty Maiden, Victors Vaccoyo, Accoyo Victor, Accoyo Royal Fawn, Accoyo Camillio, and Peruvian Camelot. Her genetics are a result of what we, in the industry, should be breeding for. Giselle's sire, 15X Champion, Aussie .38 Special, is consistently producing offspring representing all that .38 is known for. Proven genetics many times over. .38's show record speaks for itself with no less than 15 Championships, 2 x Judge's Choice, including the 2012 Dark Herdsire of the Year and Nationals Color Champion at age 6, at age 8 he won the "Spirit of the Industry" award recognizing the lasting qualities of his fleece - and the list goes on. Not always is it possible for a herdsire to pass along all of his fine traits yet Giselle has captured them all. 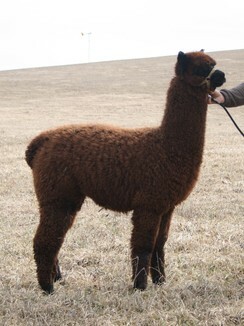 Her dam is AROSA Peruvian Mimosa, a very fine dark brown (maroonish) female who at 6 years of age is holding an AFD of 21. Both of Giselle's parents boast longevity of fineness with low AFD, SD and CV's. This little powerhouse has genetics that are proven to produce solid, healthy, fine, gentle offspring, this is our LINGERING fineness breeding program at work! If you are serious about your color breeding program, this girl will take it to the next level. Personality, phenotype and fineness all bundled into this girl. 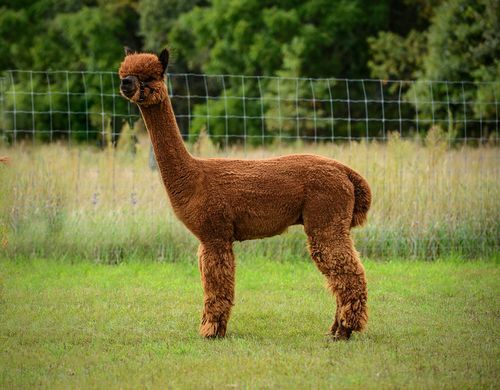 Exposed to our DF, 17x Banner winner, Snowmass Kahuna Sunrise for a Fall 2019 cria.